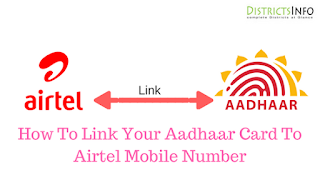 How To Link Aadhaar Card To Airtel Mobile Number: Hi folks, many of us here are Airtel SIM card users and most of us already have the message to link your Aadhar card with your mobile number. Most Of the users Having questions That Why To Link The Aadhaar Now? 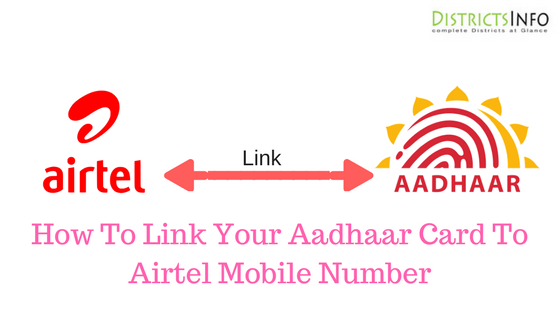 In this article, I describe the complete information on how to connect your Aadhaar card to the mobile number and complete the KYC process for your SIM card. Recently, the Telecommunications Division (DOT) has instructed all Indian telecommunication operators to review all mobile phone numbers by linking them to Aadhaar. 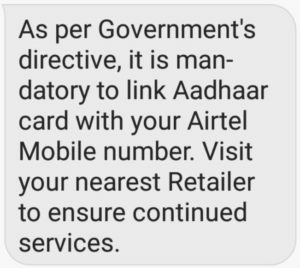 Airtel has already begun sending Message To Link Your Aadhaar Card With Airtel Mobile Number, and most other operators also send messages to their users. According to The Department of Telecommunication (DOT), the connection of Aadhaar will give its users security and can be Lower Down The Fake SIM Card Holders. Also check here: How to link Aadhaar card to Vodafone mobile number. Aadhaar Card copy of the owner of the SIM card and its number. Switched ON Mobile With SIM Card. First of all, if you have the previous SMS. Then visit your nearest Airtel retail store. Enter the mobile number and the Aadhaar card number with you to the storekeeper. He will send a four-digit verification code to your number for the verification process of the next stage. You must give this verification number to the storekeeper again. The storekeeper will request your fingerprint for biometric verification. Within 24 hours you will receive another confirmation message for the final confirmation. You only have to reply with the word "Y", the verification process is finished. Your SIM card has been successfully linked to your Aadhaar card.